Infant chimpanzees weigh about four pounds at birth. By adulthood chimpanzees weigh approximately 95-150 pounds and are 3 to 4 feet tall. A chimpanzee's body is covered with short thick,black hair. Chimpanzees are very social animals." Chimpanzees as a whole usually live in large groups of 30 to 80 chimpanzees: females, males and their offspring. However, chimpanzees divide into smaller groups for hunting and foraging. This allows them to cover more ground and be able to feed from the best foraging locations (Monkeys and Apes p.26). "Separating into smaller groups also decreases the ' constant ' dissension among competing male chimpanzees "(Monkeys and Apes p.27). "Female chimpanzees give birth to a single infant about every 3 to 5 years so the arrival of a new chimpanzee is special and exciting for the other chimps in the group "(Monkeys and Apes p.28). "Baby chimps weigh only about 4 pounds at birth and are as about as helpless as human babies. Female chimps give their baby lots of love and affection. 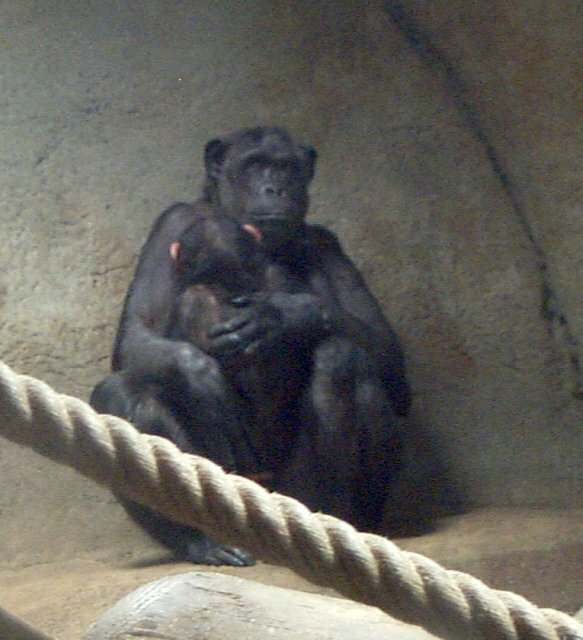 This love and affection can be seen when the mother chimp cradles and rocks her infant to sleep. Even her breast feeding is second only to that of a human mother" (Monkeys and Apes p.30). "Young chimpanzees depend upon their mothers for years to teach them about their world as a chimpanzee. "(Monkeys and Apes p.31). "Growing up as a chimpanzee involves long hours of play and learning in groups of 2 or 3 pre-adolescent chimps. The males jump, wrestle, chase one another, and pull on each other's tail. Interaction with older chimpanzee males usually involves a lot of male competition games" (The Primates p.102). "Chimpanzees learn to build nesst for sleeping in at night.The youngest of the adolescent chimpanzees usually beds down with mother until he is older. 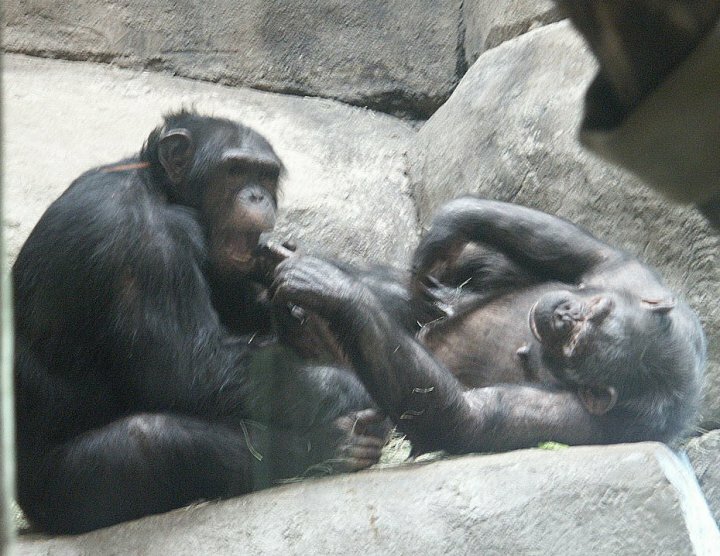 Nest sharing by older adolescent chimps is also common" (Primate Behavior p.385). "But not all chimpanzees prefer to build their nest, some mischievous chimps prefer to steal a nest from a wandering chimp" (Primate Behavior p.388). freely mix with the others but not with the baboons or chimpanzees" (Primate Behavior p.389).
" Chimpanzees are intelligent animals capable of possessing a level of intelligence that enables them to learn from one another.For example, some chimps fashion twigs to use as a tool for extracting termites from their mounds." (The Primates p.153). A recent news article suggests that early humans also took advantage of this food source!
" Chimpanzees have artisttic ability as well. Zoologist Desmond Morris discovered through his working with chimpanzees that chimps paint much like human children paint.However, chimpanzees do not paint art at random. Chimpanzees possess a definite and discernible sense of form and even individual style"(The Primates p.155 ). This may contribute to the close similarities of chimpanzees and humans.
" 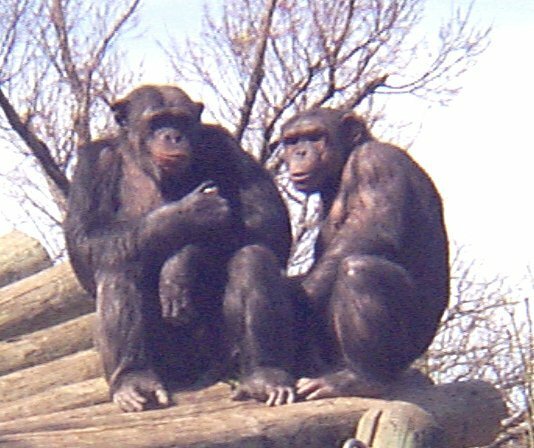 The chimpanzee is man's closest relative.There are fundamental similarities that show the two, humans and chimpanzees, evolved from a common ancestrial stock, although exactly when the two stocks separated is still hotly debated " (Monkeys and Apes p.26 ). " The chimpanzee's black thick coat has roughly the same number of hairs as a man's body, although each of a chimp's hairs are longer, thicker and dark and much more conspicious than man's. The chimpanzee's torso is virtually identical to man's except in its proportions. Long arms and short legs give the chimp a lumbering quadrupedal gait, similar to the gorilla and very different from man's upright, striding walk"(Monkeys and Apes p.26). The similarities don't end there. " The chimpanzee's reproductive processes and a human's reproductive processes are also similar. The menstrual cycle in a female chimpanzee lasts 35 days with a 10 day sexual receptive factor. Human menstrual cycles are 28 days with a 7 day receptive factor. At approximately age 13 a female chimpanzee is considered a young adult, about the same time as a female human begins transforming into womanhood"(Monkeys and Apes p.27). 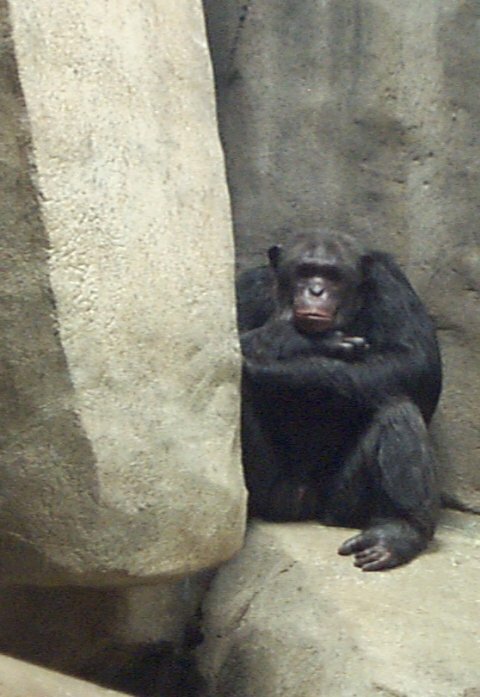 In captivity, chimpanzees learn to discriminate colors and shapes for researchers in exchange for treats. Chimpanzees also do well in token economy settings. They are actually able to learn the value of the various colored tokens, in relation to the token's buying power. Chimpanzees have also learned to fashion tools for usage. 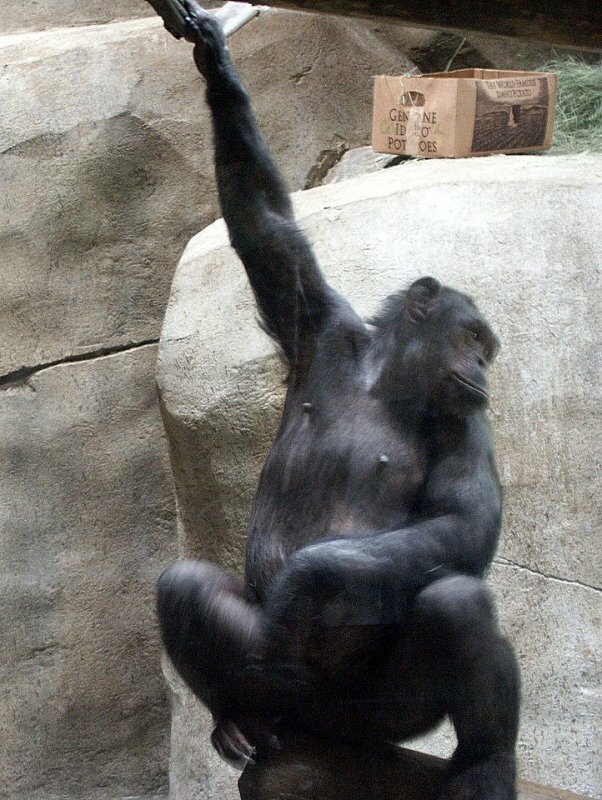 Chimpanzees have long strong arms especially well adapted for swinging from tree to tree. . Comments about the Chimpanzees at the Fort Worth Zoo. The chimpanzees at the FortWorth Zoo have recently had a new addition to their group. For an hour I watched as all the chimpanzees in the cage took turns holding the baby. The chimpanzees were very careful not to swing or roughhouse around the baby chimp. The Zoo Keeper advises that the chimpanzees are very loving towards their offspring. But they constantly fight over food and females in the group. I observed the chimpanzees caring for the new baby in the group. They often all gathered around to take turns holding and touching the baby, It was hard to tell which female chimpanzee was the mother at first until feeding time. The mother scooped her baby up at feeding time and whisked him off to a corner to fed undistrubed by the others. It reminded me so much of human mother and infant interactions. She was so loving and watchful over her baby. Human ancestors had taste for termites. Science News, Vol. 159, No. 3, Jan. 20, 2001, p. 37.